American moms, what's your day like? I want to hear from American moms what your typical day is like during the school year. I want to hear from SAHMs and working moms, and I want to know how you manage your very busy days! You get up very early in the morning to get the kids ready to get on the bus by 7am (or even earlier for some. My friend's son gets on the bus at 6:30 am). Once the kids are on the bus to school, you finish getting yourself ready and out the door to work. Your driving commute time is an average of 24 minutes each way (according to Google). Some commute for much longer, over an hour. You work all day. After school the kids go directly to after school activities and/ or after-school care. You rush to get out of work and pick up the kids before after-school care closes at 6:30. You get home after 7pm, make dinner, everyone eats. Clean-up time while the kids do their homework, practice music, etc. You try to have "family time" for at least a few minutes, but everyone is so wiped out from their long day they really just want to veg in front of the TV. You get the kids to bed, probably not early enough for them to really get a good night's sleep before they have to wake up at 6am tomorrow. Once the kids are in bed you finally have some time to catch up on emails, do more work, clean up the house a little, and oh yeah maybe have some facetime with your spouse/ partner. You collapse into bed after 11pm, to get up in the morning and do it all again. To be completely honest, I don't think people in other places in the world realize just how busy American mothers are, and especially how early your day starts. In other places, school starts later in the morning which allows for a less frantic pace in the mornings and for kids to get more sleep. As a result of the school day starting so early (which is done that way so commuting parents can get to work on time) everyone is chronically sleep-deprived. What I want to know, of course, is how do you manage your own busy schedule and your family's? I'm guessing you use Outlook or similar at work to manage meetings and workloads. At home do you mainly rely on a wall calendar, or a paper planner, or both? Do you use electronic for some things and paper for others? 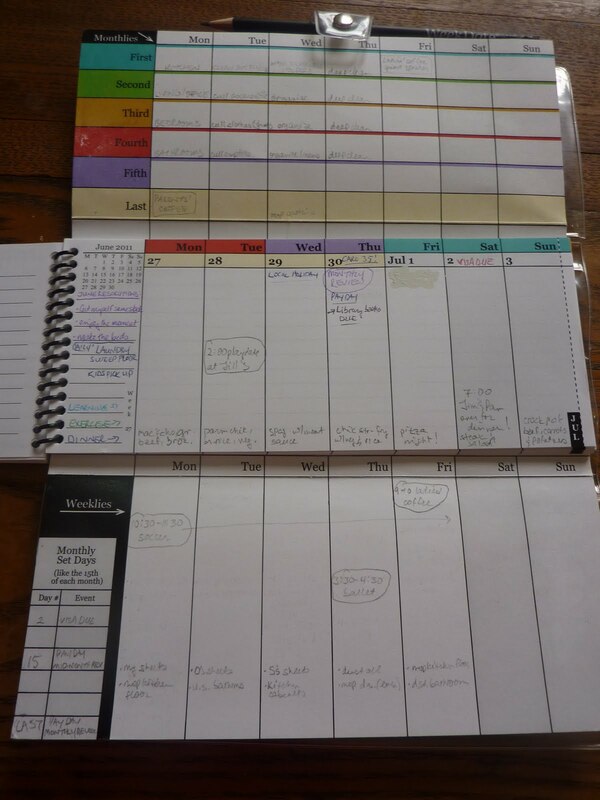 I'd love to hear what planner systems you are using to manage your busy days! Please post a comment, and tell us what your typical day is like during the busy school year. Moleskine 18 month planners begin today! 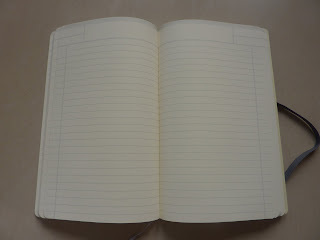 Today is the first day in the 2011-2012 Moleskine 18 month planners! These planners come in the super-popular Weekly Notebook format, or the Horizontal Weekly format. They come in a variety of sizes including pocket, large and extra-large. The 18 month planners have monthly and weekly views. They begin today, and go all the way through the end of December 2012. If you are in need of a new planner for whatever reason, are on an academic year, are transitioning from academic to calendar year planner needs, or need to start a new planner any time between now and December, you'll want to check these planners out! 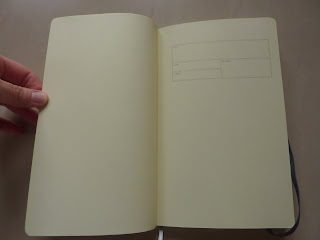 Click here to see my review of the 2011-2012 18 month Extra Large Moleskine weekly notebook. Above is my WeekDate planner open. The top section is the Monthly Recurring section, middle is Daily Specifics for the current week, left is lined space for lists and notes, and bottom is the Weekly Recurring section. Click on any of the photos in this post to enlarge. Below is the top Monthly Recurring section, showing a couple of recurring events I have (which I circle to stand out as events and not tasks), and mostly how I'm using this section to track house cleaning (similar to the FlyLady Zones). This is a work in progress and I plan to adapt these work tasks as the weeks go on and I figure out what system works best for me. Below is the weekly section, showing next week. (Click photo for larger view.) At the top of each day I write important things for that day. I circle scheduled events so they stand out. At the bottom of each day I write the dinner menu. 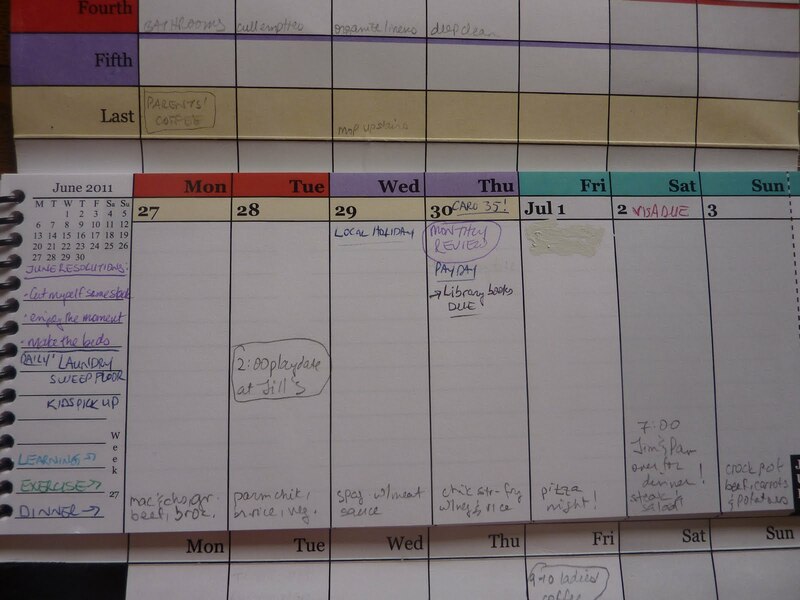 Any tasks written on the day space that I don't complete that day get arrowed over to the next day, no re-writing! The days are color-coded so I know which week of the month they correspond to: first, second, third, fourth, fifth and last. So each day I look up to the corresponding day in the Monthly section and down the column to see what I need to do each day, without re-writing anything! At the left side of the weekly section there is a lined space where I write goals and resolutions for the week. I also write reminders of things to do daily like laundry, sweep floor, and have the kids pick up their stuff (which I'm trying to train them to do!). At the bottom of this section I write things to check off or write in daily: learning activities, exercise, and dinner. I like to have a designated space for these types of things, to encourage me to do them so I can fill in the space. I'm trying to establish habits and routines, which I do not normally follow so I like having these daily reminders to guide me into what I'm supposed to be doing. 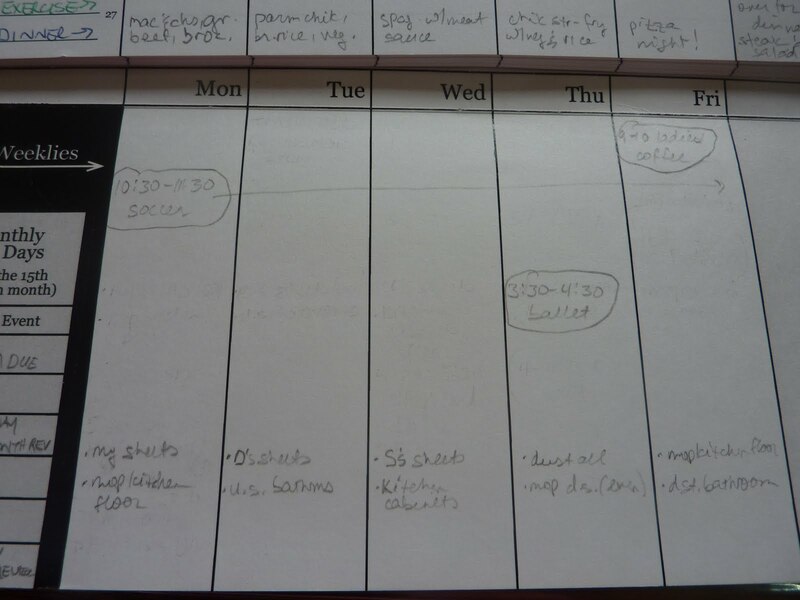 Another way I've thought of using this lined space is to have a set general daily schedule listed. I might try that on a different week. This might help me establish habits like exercise and house cleaning if I do them at the same time each day. The bottom section is the Recurring Weekly section where I write all my weekly recurring events, and also keep my weekly housecleaning schedule. I generally have upstairs things scheduled early in the week and downstairs things later in the week, so when we have people over the spaces they will see have been cleaned most recently. 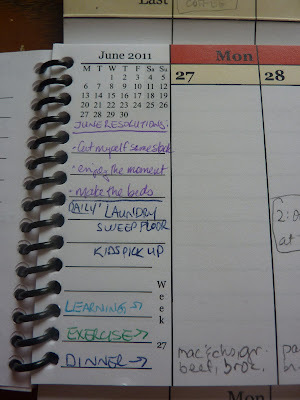 I love having the reminders of what to do each day without having to rewrite them each week! Even things that happen every day get written only once. See above there's soccer every day Monday-Friday. I wrote it once and arrowed it over across the week. In my weekly section I made a note of when is the last day. On that day I'll erase the scheduled event. After two weeks of soccer my son decided he didn't want to do the remaining 4 weeks. So I wrote it once, and I erased it once, without having to flip through and write and erase on weeks of pages! At the left of the Recurring Weekly section is a space to record Monthly Set Days. I have the day my visa card payment is due, paydays, and reminders to do my mid-month and monthly reviews. The back sides of the weekly pages are lined, and I use this space for my weekly lists. 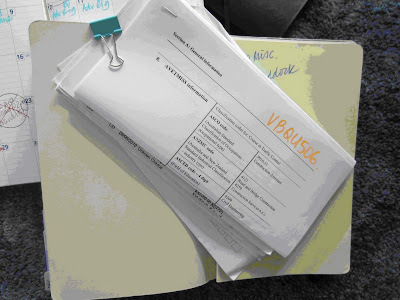 The page is in three columns, and some of these I divide further to give space for my categorized lists, space to record financial expenditures and bank totals, and learning activities for the week. Here is a view of the main sections, with the top and bottom sections pulled out of the plastic cover so you can see them better. So now you can see how I look at today in the current week, look up to the corresponding color-coded day in the monthly section, and look down the column to the recurring weekly section to see everything I need to do each day. I only write each thing once, ever. And nothing slips through the cracks because there's no re-writing or copying over week to week. I write it once, and it stays in front of me even for future planning. So when I flip weeks ahead to schedule an appointment, my recurring schedule is already there in front of me for reference so there's no chance of double-booking or overlapping schedules. And here it is in the plastic cover. You can see the clear plastic holds the cover in place without impeding your view of what's written (it's just a little shiny from the light reflection into the camera). 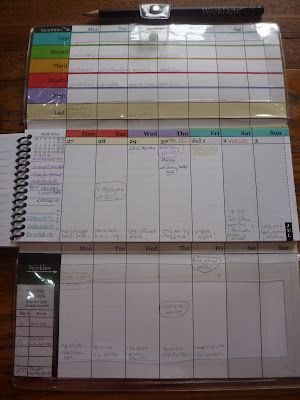 Click here to read my original review of the WeekDate planner to see more of the planner's features like the tear-off weekly tabs, Annual record, Phone list, pre-printed holidays, annual calendars and more. If you want to try out this system, you're in luck! 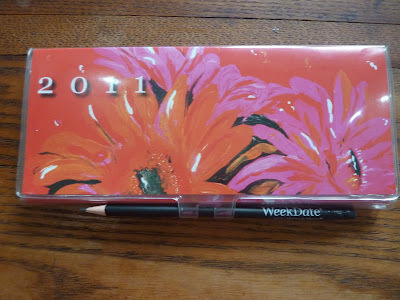 The 2011 WeekDate planners are still available, click here for the product page. And, you can pre-order your 2012 WeekDate planner now for August delivery, click here for the 2012 WeekDate planners. 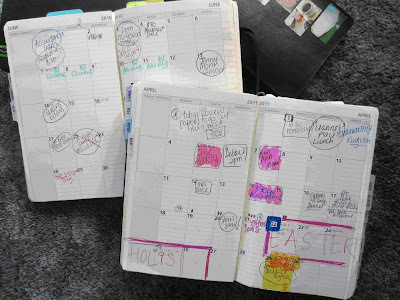 If you have any questions about the WeekDate planners or how I'm using mine, please post a comment! I immediately fell in love with this notebook as soon as I opened it! Before I get ahead of myself: Poppin (www.poppin.com) is a new brand of office supplies and stationery products that bring much-needed color and fun into the office environment. I won this medium soft-cover Write-Now notebook in a giveaway from Poppin as announced on Notebook Loves Pen. Many thanks to Poppin for this excellent notebook! So, as I noted above, it was love at first sight with this notebook. 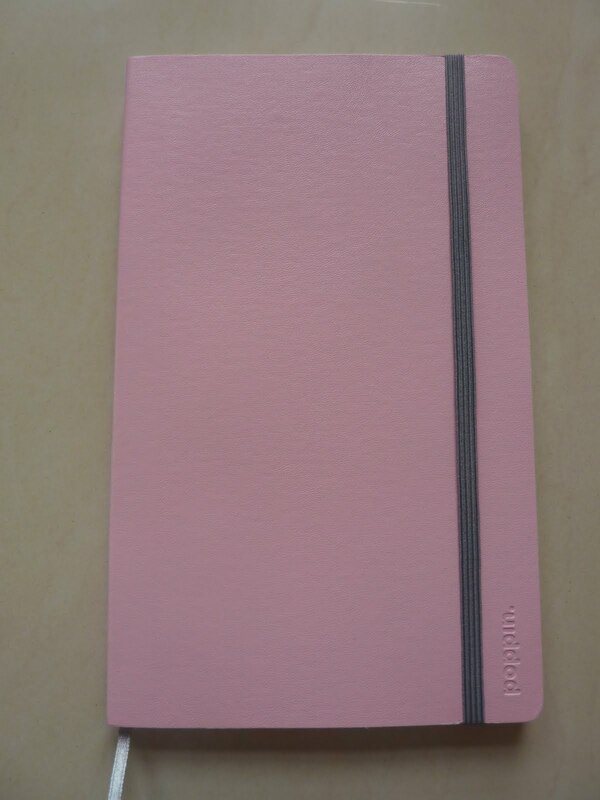 I love the slightly iridescent pink soft cover with the coordinating gray elastic band. It's so pretty! This notebook is ruled, with 192 pages and measures 5 by 8 1/4 inches (12.7 x 21 cm). Inside there is a space to record your contact info in case your notebook is lost, and also a spot to list the title of the notebook. I love the way the pages are formatted with more than just the usual lines. (Click on photos for a larger view.) The pages have spaces at the top for title, date, subject or anything you like; and spaces at the page edge for checking off tasks, noting a date, writing a follow-up action code, etc. There is a full-size pocket in the back of the book to hold cards, papers, receipts, tickets or any scraps of paper you want to save. I haven't done an ink test, but Notebook Loves Pen has done an excellent one so click here to see how the paper performs with ink. At $8, this notebook is significantly cheaper than the equivalent-size Moleskine, and comes in a wide selection of colors including brown, red, white, black, and pink. Thanks again to Poppin for this excellent notebook! This is a very attractive, classy-looking, fun notebook that has a structured format that encourages organization. Be sure to check out Poppin's dazzling array of supplies in a rainbow of colors! Here are a bunch of planners that people have suggested I try or that I've found myself, but have never gotten around to ordering them up. They all look really good and some of these have incredibly innovative formats. I've had a bunch of people ask me for planner recommendations lately, and although I can only give advice on planners I've used myself, I thought I'd throw these out there as some possibilities. Please click through the links to see the products. Redstar Ink makes a cool-looking planner that comes in calendar year, academic year and undated formats. 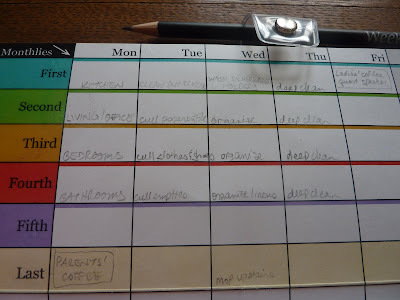 It's a weekly view with all 7 days as full-size spaces and the 8th space for lists. It also has month per page calendars with the opposite page lined for that month's lists and notes. They also have other calendar products that look really good. A similar concept is the Bob's Your Uncle 8 Days a Week planner, which has columns for all 7 days and the 8th column for Someday. It's undated so you can start it any time, and comes in Desk or Mini sizes or as a tear-off pad. They also have an undated wall planner that shows the entire year at once, and is color-coded to the seasons. 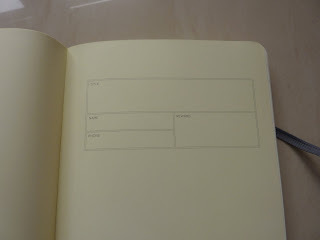 Another planner I've never tried but looks very organized is the A4 Architects and Designers Planner. I'm sorry I forget who recommended this to me, but thank you for the suggestion! I'm still keeping this in mind for 2012. 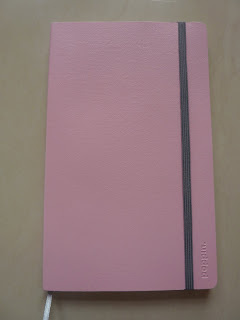 This planner has daily columns and space for notes, and comes in red, black or silver covers. 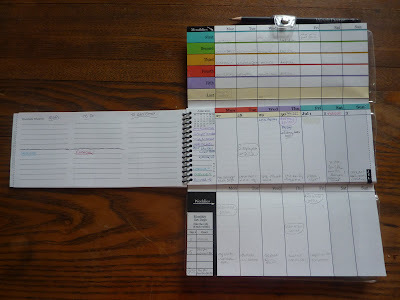 Rori recently asked me if I've used the BizziMom planner, and the answer is no but I've looked at it online before. 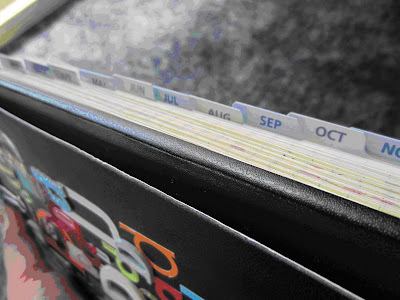 It has a brilliant format of huge monthly calendars that fold into a normal size book. This is a great option for anyone who needs a monthly overview with lots of space to write, but still needs to carry the planner in your bag. Rori, and several other people, have recommended I try a Planner Pad although I've never taken the plunge (and I'm not sure why). Rori did an excellent review of it, click here to see. Beth asked me recently if I've tried MyAgenda or MomAgenda planners. This is another planner I've looked at several times online but have never made a purchase. These planners have a weekly grid format to help you keep track of multiple people at once (like kids and spouse) or track things like exercise, meal planning, or any other categories you'd like to create. Here's a planner that looks really great: The Woman's Planner has simultaneous weekly and monthly views that turn independently (similar to the Rabbit planner I reviewed awhile back). It also has pages to track your budget, appliances, savings goals, wish lists, notes and a pocket to hold papers. Click the link above and scroll down their page for all the details of the features and to see photos. I'm really tempted to try this one! Another amazing format is the Laurel Denise planner, which shows weekly pages alongside the monthly view. 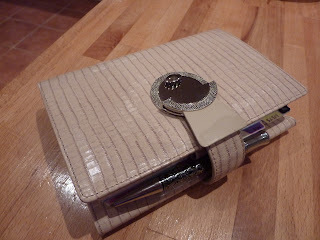 These planners are currently sold out, but I wonder if she'll make them again for 2012? Have you tried any of these planners? If so please post a comment and tell us about it! Do you know of any other 'off the beaten path" planners I haven't mentioned? Please share! The votes are in! Many thanks to everyone who cast their vote to help me decide which Filofax to use: my personal Deco as my info book with a separate planner, or my A5 Domino as my planner + info book all in one. The Deco won by a (surprisingly narrow) margin! For the past week while the poll was going on, I used my Deco Filofax with self-drawn week + notes pages, and my pocket Moleskine daily diary as my day planner + logbook. 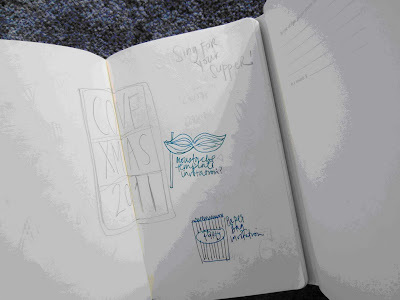 I realized that two smaller books fit into my bag more easily than one huge book, so I used the Deco instead of the A5. I tried using the week + notes pages in the hopes that my Deco could be my planner + info book in one. 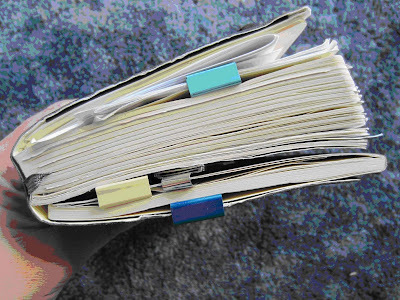 But not surprisingly, the personal size week + notes was an epic fail, as all my personal size diary page experiments have been for the past few years. Specifically what did it in was that the pages were too small to write everything I had to do during the week. I tried writing some lower-priority tasks and categorized lists (like blog topics) on separate pages behind my Lists tab. 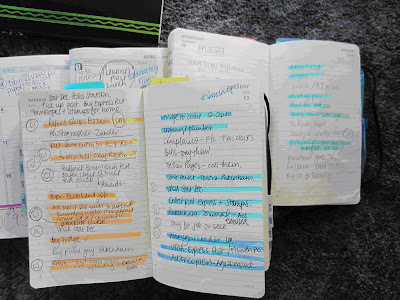 But, as you may know by now, I am Out Of Sight, Out Of Mind so in order to remember my tasks I felt like I had to flip through the pages constantly so that nothing would get forgotten for too long. As a result, I had too many places to look and couldn't keep on top of my tasks. I spent the week floundering and feeling like I didn't know what needed to be done. Classic Planner Fail. So I went back to using my self-made planner. Meanwhile, I still haven't answered your question: which Filofax am I using? My Deco went everywhere with me all week, in and out of my bag, on my desk, out and about. 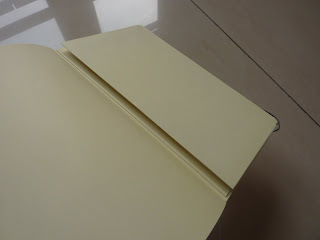 After just the one week there are several scratches on the cover (*sob*). I decided to re-assess whether I need to have my Deco with me all the time. More than half its contents are better off at home. The beautiful leather binder is heavy. And if it were ever lost or stolen I'd be extremely upset. I realized I'm happier keeping my Deco at home, and what I actually need to keep in my bag at all times is my Medical Filofax, which is a personal Domino in Grape. In it I have medical summaries for myself and each member of my family. I added Emergency and Insurance information, and updated the addresses and contacts in the A-Z tabbed section, and now it goes everywhere in my bag with me. The Domino is very light, I don't mind if it gets scratched, and if it ever went missing it wouldn't be a huge loss (just of time to re-compile the information it contains). 1) The one that lives in my bag constantly is my Moleskine info book, housed in my leather Renaissance Art cover. This is where I capture all Indonesia-related contacts, business cards, information etc. I've discovered that location-specific information is better off being captured in a bound book where pages can't get lost. Then when I move away from Indonesia I can archive the whole book. 2) My Medical Filofax so I'm prepared for any eventuality. This book is independent of Indonesia, so if we move away next year I don't have to dig through the pages to remove any location-specific information. 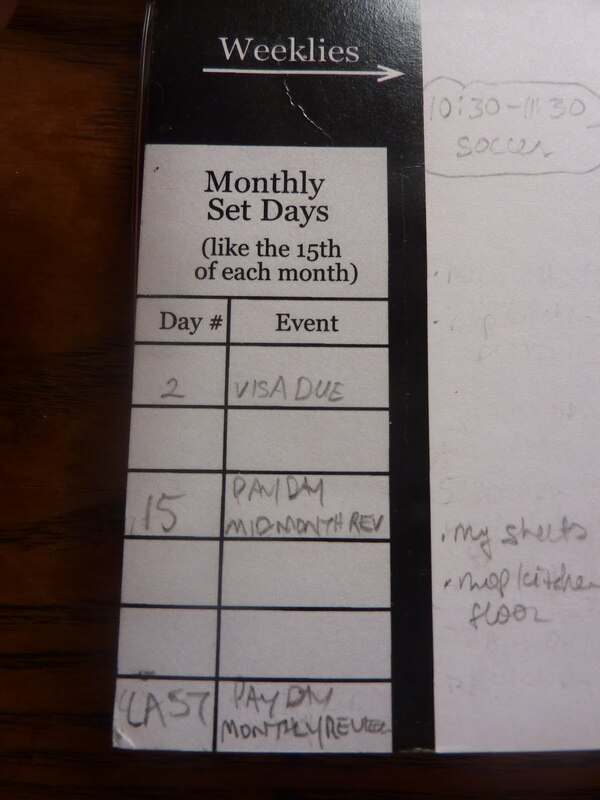 3) My daily Moleskine pocket size planner/ logbook. I adore this little planner. I'll write a post specifically about this book soon. 4) My weekly planner. Currently this is my self-made planner, but this will change soon. So, my A5 Domino never even made it out of the gate. It's so big I can't even force myself to carry it in my bag. You are probably thinking, it's probably just as big/ heavy as all 4 of these books together. You might be right. But as it turns out, I prefer to have these books separately. Part of the reason is because I like the permanence of a bound book as my planner and as my info/ reference book. I lose pages too easily when switching them around. So even though it would seem convenient to have my planner, logbook, local info, and medical all in one enormously fat book, I actually prefer the smaller, bound books. The one exception is my Medical Filofax which needs to be a ring binder so I can add to each person's section as needed. So the only thing yet to settle on is which weekly planner I'll use. I'm (still!) 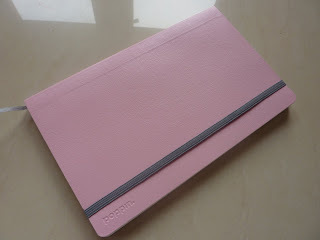 waiting for my sea shipment to arrive, at which time I will grab my WeekDate planner and start using it. I've been pining for it for weeks now, and am very annoyed with myself for not putting it into my suitcase! I wonder if I will use it as my all-encompassing planner, or if I will prefer using it for FlyLady Zone work and household routines. Runner-up as my weekly planner is my Extra-Large Moleskine weekly notebook, which starts in less than two weeks. The WeekDate has the advantage of folding up super-slim and small, making it easy to carry in my bag (which is significant when I'm already carrying around a library!). Often in my planner I write notes to my future self. Sometimes these notes are straightforward information. For example: my kids' school allows us to check out books from the library over the summer, after paying a $150 deposit. On my weekly notes page the week school starts, I have written a reminder to myself to take the deposit form to the school and collect my refund. I even noted where I filed the deposit form, since I'm apt to forget. In the past I've written other notes to my future self in the form of questions. A few years ago we went to see a town where we were considering moving. In my planner on the first day we were scheduled to be in the town I wrote, "What are my first impressions?" On the last day of our visit, I wrote, "Do I think I would like to live here? Why or why not?" The answer was, definitely not. Question answered. Do you ever write notes to your future self in your planner? For those who chose "Other Brand" many of them posted a comment on the original post to say what brand they use. Brands listed were: self-made, Success, Day Timer, Quo Vadis, Rhodia, MomAgenda, Circa, and Dodo Pad. I had a realization yesterday that I absolutely must have my Filofax on my person at all times. Never leave home without it. Yesterday the school called to ask me to come get my daughter, because she was ill. I brought her home and took her temp, which was high. Just a month ago she had an extremely high fever caused by a major infection which got her 5 days of i.v. antibiotics, and I didn't want a repeat of that situation so straight to the SOS clinic we went. Luckily I grabbed my Filofax, which normally stays at home, before we left. 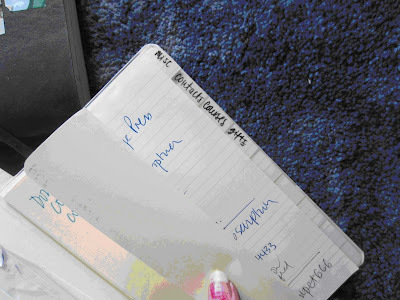 I always need my Filofax in medical situations to reference information. I was glad I had my Filofax with me, and decided I needed to update it with everything we might need in any situation. Later when everything calmed down, I talked to my husband about my Filofax idea. I said I would set it up with all our relevant medical info, vaccine information, medications (like the name of the i.v. antibiotics my daughter had during her infection last month), the F - C temp conversion chart I mentioned in my comment on Philofaxy, addresses and phone numbers, etc. He had a very good point, which he always does: "Long range planning--whatever. We need to have the information we need right now." That settled it. So now I've redone my tabs in my Filofax, added some info and taken out irrelevant things. I'll keep my Filofax in my bag at all times, no matter how bulky and heavy it is, so that we can go straight from the school to the doctor if we need to, or even grab our passports and jump on the plane if necessary. I went back and forth over which of my Filofaxes to use. I decided to use one of my personal size Filofaxes so it could fit in my bag easily. I thought of using my personal purple Finsbury or my Urban so that I wouldn't worry about getting it messy or scratched. But then I thought, why rob myself of the opportunity to use my Deco on a daily basis? Yes I run the risk of marring its pristine beauty. But I like the idea of using it year after year and letting it age naturally. Deco and I can age together. 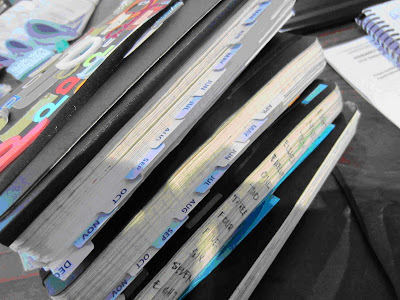 But using a personal size Filofax begs the question: what about those small planner pages? Those have always been my downfall with a personal Filo. I'm using the monthly and weekly pages in my Filofax the same way I used monthly and weekly pages in my self-made planner for the past couple of months. Those daily spaces were too small so for the past month I've been also using my pocket Moleskine daily planner to plan each day. This allows me to have plenty of room each day, and record details of my days. And this system has the added benefit of allowing me to have my daily Mole and weekly Filo pages open alongside each other to see the daily details and weekly overview at once. Whether I stick with this planner setup forever doesn't matter. What is now abundantly clear is that I can never be without my Filofax. After years of going back and forth, this decision brings me a lot of comfort. I've finally figured out one aspect, at least, of my planner needs. I don't know what planner I'll be using next month or next year, but I do know that I can't be without my Filofax. But now my question is: should I use my Deco and a separate planner? Or should I use my big A5 Domino that can contain my planner plus everything else? I've abandoned my A5 due to size before. Maybe I'll try carrying around each and see the difference. I know! I'll do a poll! Let me know what you think. 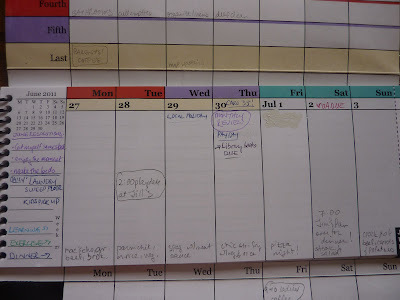 Guest post: Dora's work diaries! 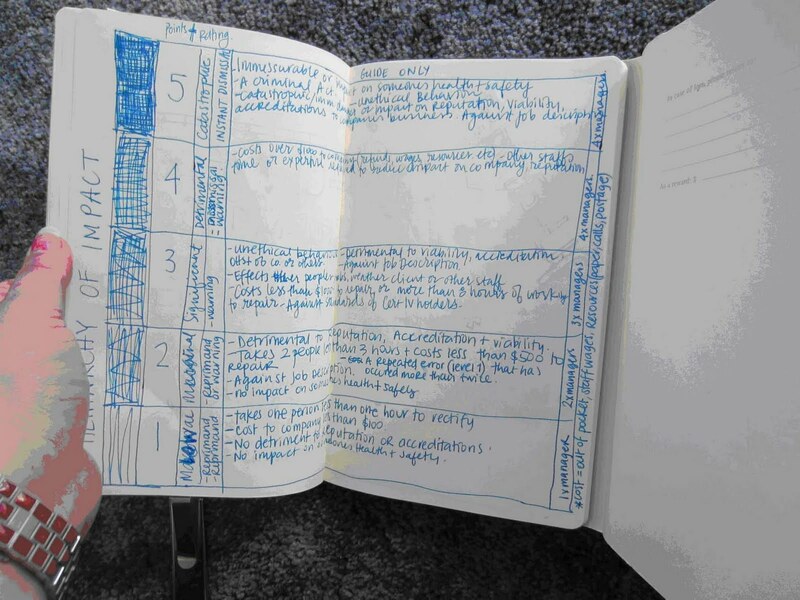 Dora very graciously agreed to do a guest post detailing how she uses her large softcover day per page Moleskine planner as her work diary! Click on any of the photos for a larger view. Ok, so I am new at this blog stuff, and also new at letting people look at my boring work diaries, so bear with me! So, I have kept ‘work diaries’ all my working life. In the days before computers became the norm in the workplace (showing my age here! ), your ‘diary’ is where you kept everything. I used to work in real estate, so back then, the Real Estate Institute of Victoria (REIV) used to issue its members with these hard-bound day-per page quarto sized planners, that everyone used so I suppose I got used to that format, size and style from an early age, until, one day, sitting on top of the discount bin near the checkout, I encountered my first Moleskine. I, of course, had absolutely no idea what I had stumbled upon. I had never even heard of the brand before as, in Australia, Moleskines are hard-to-find items. Elite stationary and large bookstores in the city were your only option then (before the online revolution, that is), so I really had no idea that they had such a cult following until I was watching the news one night and they ran a story about how Jennifer Hawkins was seen ‘writing in her Moleskine diary”. I thought it was odd that they mentioned the brand, but sure enough at work the next day, everyone recognised the name of the diary, and all of a sudden all the girls wanted one as well. The following year, we did a bulk on-line order for them! Initially, I just liked the look and feel to it. It attracted me primarily because it was soft bound, day to a page and smaller than quarto (fitting into the handbag was easier!). I wasn’t even going to use it for work, more a personal diary (and they are whole different story). Now I am in the fourth year of using the Moleskine for work, and although I find it hard to commit to any kind of notebook or journal for other purposes, I have to admit, it almost feels like the Moleskine and I are in a committed long term working relationship! 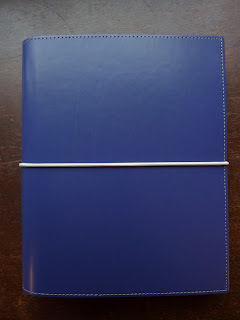 Essentially, it holds all my appointments, ideas, forward planning and to-do-lists. My husband and I run our own training college and we employ about 25 staff, so there is quite a bit I have to keep track of. This allows me to plan the week in advance, and the tasks around any appointments I have to attend to as well. 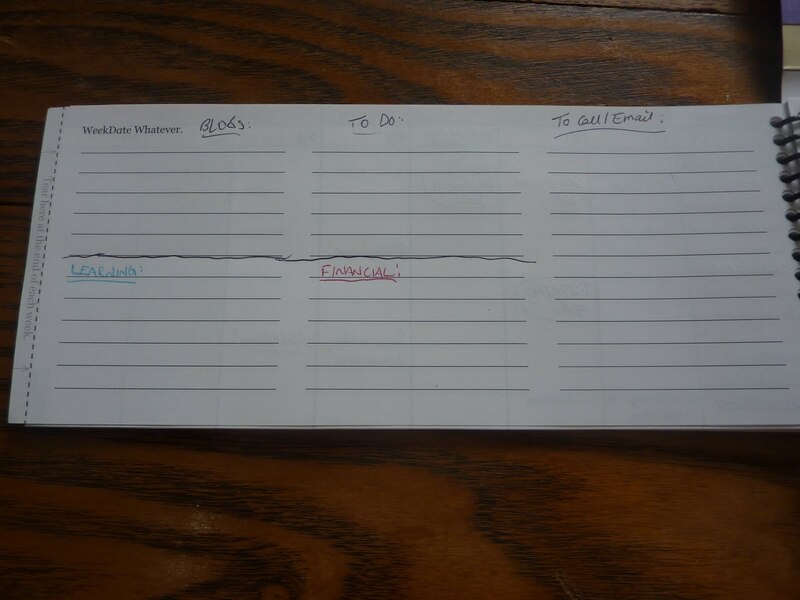 Although I applaud Moleskine for adding in the monthly style calendar planning grids this year, I found that they are too small and narrow for my use. So from last year I hacked my own monthly planner pages into the diary. 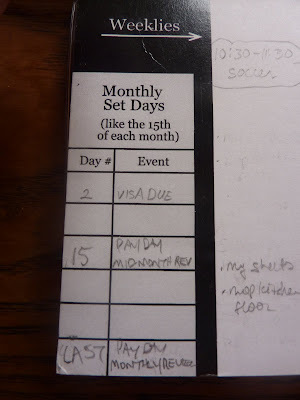 I found some tabbed monthly planner inserts made by Collins Debden and have pasted them in at the beginning of each month. They take up two pages, so I pasted them in to the closest Saturday and Sunday pages to the beginning of each month. Where there were no close Saturday/Sunday pages, I paste it in on the closest Saturday/Sunday page BEFORE the next month. 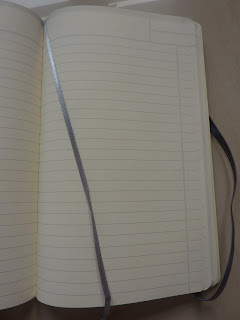 These make it pretty easy to find where I am at, as I find that I use the ribbon for my daily page. 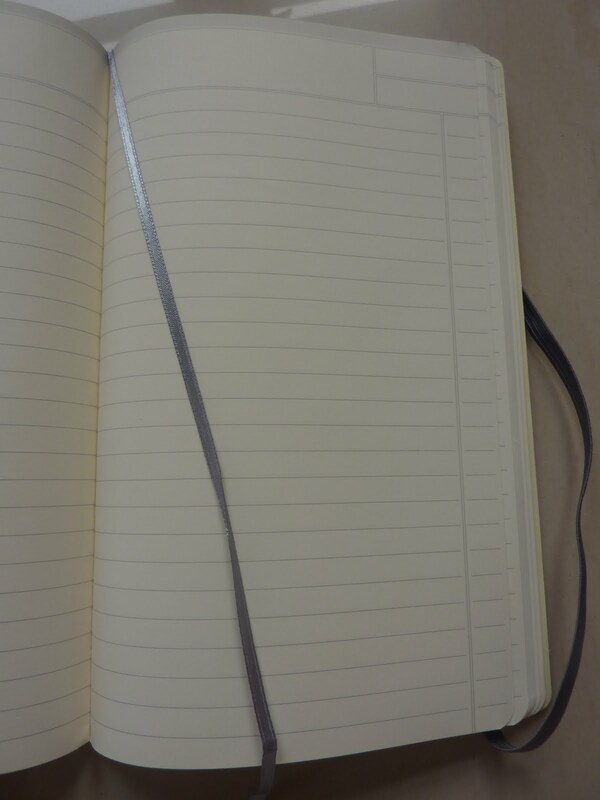 At the very front of the diary, I have used normal binder clips to attach a thin Moleskine plain cashiers journal. The purpose of this is for more planning/sketching space for longer-term projects that may stretch into the next year. The idea being, that I unclip the cashiers journal and attach it to next years diary, and can easily access it and take it out to work on, an then simply clip it back in. Here is a picture of an idea I came up with for a policy that we are going to implement in January 2012. I use this for ‘fun’ things too, like a friends baby shower that I am organising, and a few ideas I have had for this years Christmas Party. At the back of the planner, is where I tend to just throw in other bits and pieces that I may need. For example, a couple of bills I need to pay personally, a note from the gardener with a contact number on it, etc. 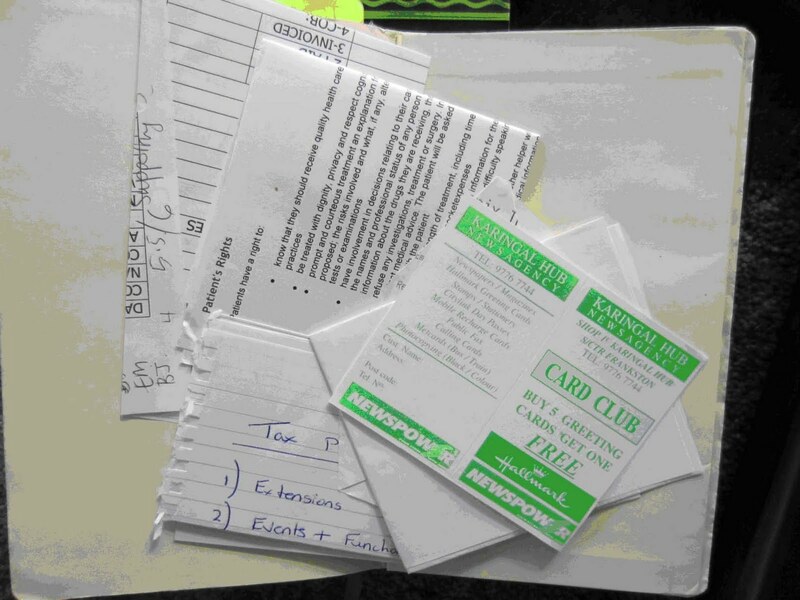 The back pocket that comes with the diary holds extra smaller bits and pieces, like business cards, a CD someone gave me, and other random things. Inside the pocket is a smaller Moleskine (again) insert book that I found in a previous years diary that has tabbed sections. This just holds some random peoples emails addresses, a few courses that we are hoping to provide in the next few years (I cross them off as we go), gift ideas I have for certain people and other misc ramblings. All in all, this may not be suitable for everyone, but I have found that my ‘system’ keeps evolving as time goes on, and it works for me to organise myself in this manner.